Done with the semester! Woohoo! A Black Forest Cake Smoothie recipe to celebrate! I’m super excited. Yesterday I finished all my work for the term at college. I have one class this summer, and two classes in the Fall before I complete my Bachelor of Science degree in Organizational and Community Studies and Psychology (It’s a bit of a mouthful, I know!) Since I am so close, I will be walking with my class at College Unbound this May 30! I’m so excited. In two weeks I will be giving a special presentation on my journey towards this achievement and feeding people delicious vegan treats! 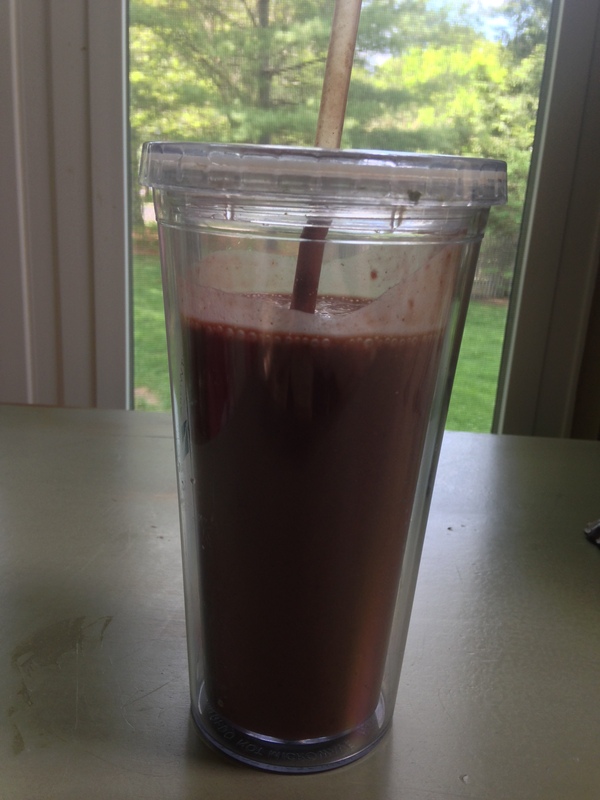 Anyhow, I think I’ve created the most delicious vegan protein smoothie ever!! It’s a Black Forest Cake Smoothie! For a long time as a child, my brother would request black forest cake every birthday. It was his favorite, and sometimes difficult to find. Last week, this obsession of his randomly popped into my mind, and I realized what a great smoothie it’d be! In a blender, blend everything together until smooth. Serve in a cup. If you use a small straw, some of the chocolate chips from the brownie mix may get stuck inside, so beware. I’m so happy that I’m so close to being done with school and have a bit of a break! I am looking forward to posting here a bit more frequently!! I have a plain protein powder. Is there a substitution I can make? ← Coconut Mango Muffin Madness!